Lactose is the principal sugar (or carbohydrate) naturally found in milk and dairy. Lactose is composed of glucose and galactose, two simpler sugars used as energy directly by our body. Lactase, an enzyme, splits lactose into glucose and galactose. Human milk contains 7.2% of lactose (only 4.7% of lactose in cow’s milk), which provides up to 50% of an infant’s energy needs (cow milk provides up to 30% of an infant’s energy needs). 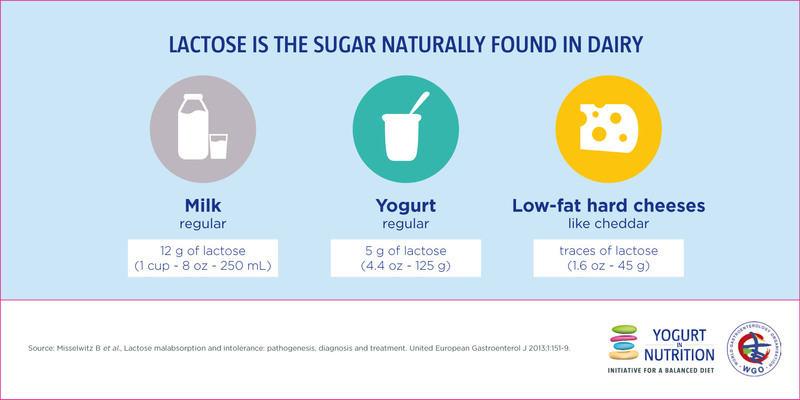 Although glucose could be found in several types of foods, lactose is the only source of galactose. Galactose has various biological functions and serves in neural and immunological processes. Galactose is a component of several macromolecules (cerebrosides, gangliosides and mucoproteins), which are important constituents of nerve cells membrane. Galactose is also a component of the molecules present on blood cells that determine the ABO blood types. According to more recent studies, lactose may play a role in the absorption of calcium and other minerals such as copper and zinc, especially during infancy. Moreover, if it is not digested in the small intestine, lactose may be used by the intestinal microbiota (the microorganism population that lives in the digestive tract) as a nutrient (prebiotic). Lactose and other milk sugars also promote the growth of bifidobacteria in the gut and may play a life-long role in countering the aging-associated decline of some immune functions. Amaretti et al. Appl Microbiol Biotechnol 2006; 73: 654-62. He et al. Eur J Clin Invest 2008; 38: 541-7. Kobayashi et al. Am J Clin Nutr 1975; 28: 681-3. Lukito et al. sia Pac J Clin Nutr 2015; 24 Suppl 1: S1-8. Vandenplas et al. Asia Pac J Clin Nutr 2015; 24 Suppl 1: S9-13. Venema et al. International Dairy Journal 2012; 22: 123-40. Vulevic et al. Br J Nutr 2015; 114: 586-95. Ziegler et al. J Pediatr Gastroenterol Nutr 1983; 2: 288-94.